Preface (G.B. Jones, M. Palumbo). Introduction to DNA Sequence-specific agents (M. Palumbo). Sequence-specific poisons of type II DNA topoisomerases (G. Capranico et al.). Topoisomerase I-targeting drugs: new developments in cancer pharmacology (B. Gatto, L.F. Liu). DNA sequence recognition altered BIS-benzimidazole minor-groove binders (J.W. Lown). Sequence-specific recognition and modification of double-helical DNA by minor-groove binding conjugates structurally related to netropsin and distamycin (C. Bailly). New developments in the use of nitrogen mustard alkylating agents as anticancer drugs (W.A. Denny). DNA binding of nonclassical platinum antitumor complexes (N. Farrell). Kedarcidin and maduropeptin: two novel antitumor chromoproteins with selective protease activity and DNA cleaving properties (N. Zein, D.R. Schroeder). Antisense- and antigene-based drug design strategies in oncology (K.H. Altmann et al.). Sequence-specific recognition of double-stranded DNA by peptide nucleic acids (P.E. Nielsen). In this volume the entire focus is devoted to the macromolecule target specificity of DNA interactive developmental therapeutic agents of current interest. A brief introduction to DNA interactive anticancer agents is included for readers who may benefit from an overview surrounding the developments that have contributed to our general understanding of this field. The following nine chapters have been carefully chosen so that they describe topics which are at the forefront of development in DNA-targeted cancer chemotherapy. 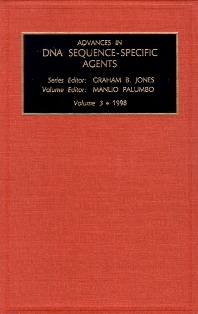 Issues that have been addressed include the mechanisms of selective DNA topoisomerase I and II poisoning by antitumor agents (Chapters 1 and 2), sequence-specific recognition of DNA by groove-binding drugs and drug-conjugates (Chapters 3 and 4), recent developments in nitrogen mustard alkylating agents and their potential use for antibody-directed enzyme-prodrug therapy (Chapter 5), nonclassical platinum anticancer complexes, including dinuclear and trans-platinum derivatives (Chapter 6), DNA cleaving antitumor chromoproteins containing reactive enediyne moieties, which exhibit interesting free-radical chemistry along with selective targeting (Chapter 7), the potential of new sequence-specific antisense and antigene therapy in oncology (Chapter 8), and finally the conceivable chemotherapeutic use of mimetics of the DNA structure, obtained by substitution of the sugar-phosphate natural chain with a peptide backbone, the so-called peptide nucleic acids (Chapter 9). Important approaches being currently investigated for selective cancer treatment, such as gene therapy and immunochemotherapy, are not discussed in this volume since they fall beyond its scope. For scientists, students and researchers interested or involved in the field of DNA sequence specific agents.